Certified Practicing Accountants (CPA) Australia is a client that plans to expand market share by appealing to the Chinese community both in Mainland China and Australia. The first phase of their marketing plan was to create brand awareness among its target audiences, including international students who are interested in CPA courses and workers seeking progress in their career path. CPA Australia’s relatively low brand awareness in the Chinese community compared to its competitors presented a challenge. To bridge this divide and avoid cultural misunderstandings, CPA found itself a Chinese marketing partner – Digital Jungle. Of the 668 million active Internet users in China, almost 99% are active social media users. Digital Jungle placed strong strategic focus on the popular Chinese social media platform Weibo to market CPA Australia. 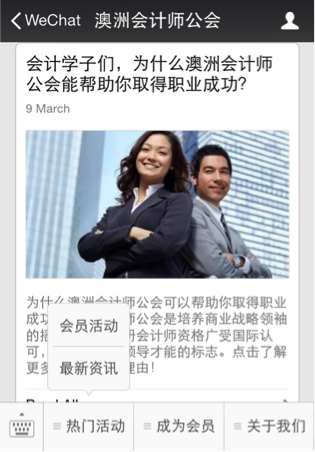 Creating topics using double hashtags is crucial for Weibo users to see CPA posts when searching for related terms. However, the topic #accounting# had low relevance to the broader audience hence it was substituted with broader topics such as #career tips#, #job seeking tips# and #leadership#.Prior to Digital Jungle’s involvement, CPA Australia had multiple Weibo accounts for its various Chinese branches. To avoid confusion, Digital Jungle recommended streamlining these to one account. Digital Jungle also introduced a collaborative plan with Key Opinion Leader including accounting, career, finance, and overseas education industry leaders, which succeeded in increasing brand awareness. Key Opinion Leaders are crucial in building brand trust with Chinese audiences. Thrilled with the results, CPA requested that Digital Jungle set up and manage their offical WeChat account as well. With over 468 million users worldwide WeChat is vitally important in talking to the Chinese community. Digital Jungle was successful in attaining 2,000 followers for this WeChat account in the first month of operation.